Over the past years I’ve used these deodorants on a regular basis (my husband used Aramis and I switched from Donna’s Cashmere Mist to Aramis in the winter and Odorex Extra Dry in the summer). And although they worked very wel, they are very strong (with many ingredients to make this happen of which a lot I am convinced are not very healthy for my skin and body in the long run) and expensive (wel Aramis and the Cashmere Mist are anyway) so I was always looking for a healthier, more natural option but would also get the job done. I’ve tried quite a few, let me tell you but I just don’t like to smell bad so a lot of them ended up in the trash. Until I met the boys from Ohm Deo Dorant that is, we met at a Young Living event in the Netherlands and at a Health and Healing trade show. I was intrigued by the simplicity of the product, a safe natural (based on essential oils and sodium bi carbonate) and effective deodorant that supports the bodies own process. They describe their deodorant as “The most effective natural deodorant available, in powder form. By using the most exclusive essential oils with the highest quality possible, our Deo Dorant actually protects your scented body rather than damage it, whilst keeping it ultimately fresher and more alkaline than anything natural or synthetic available. And you know I would not have shared this new favourite find if I had not put this product to the test and loved it ! It has kept me fresh during my tough workouts with my personal trainer, when I had my first presentation in front of at leas 50 (!) people for Young Living and even when I get up in the morning and am working in my sweats behind my laptop and shower around noon (yes that happens every now and then and I’m sure I’m not the only one LOL). My youngest dude and I use coconut and my husband and oldest dude are using Sacred Frankincense. And using it is so easy ! I apply it directly when I get out of the shower, I don’t dry my armpits as they have to be a bit damp. I shake the container onto my hand twice and apply under my armpit and a bit above and below (you know above and under where the hair used to be 😉 ) and that’s more than enough for a long day of freshness, no matter what you encounter ! 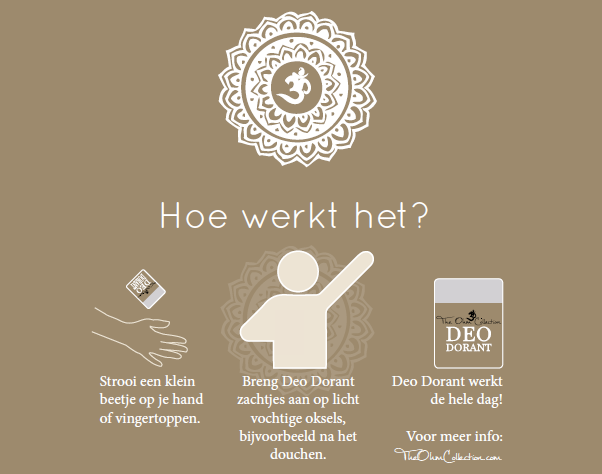 Ohm deo dorant is available in 8 fragrances ( I have listed them below) so there is always one that will take your fancy, no matter which gender you are. I Iove the fact that they offer them in a small packaging () to sample them for their effectiveness and scent for under 3 euro’s ! A large container is 21,95 which will go a long way (at least 6 months) as you only need to apply1 to 2 doses in the morning to get through a day. They also have a teenage/kids line, No Sweat, which I will be ordering soon for the dudes (al versions are sold online at my fave online store Green Jump). Patchouli (Pogostemon cablin) is a wonderful oil that comes from the Pogostemon cablin plant. This oil has been used for over hundreds of years to relax the mind and clarify thoughts, however here in Europe it was made famous by the beatles. Patchouli has a deep, rich, earthy-sweet, spicy aroma. Ingredients: Ohm Blend®, Patchouli (Pogostemon cablin), Wildcrafted Cedar (Cedrus Atlantica wood) and Tea Tree oil (Melaleuca alternifolia leaf) blended with sodium bicarbonate. The Lavender Deo Dorant is a combination of Lavender (Lavandula angustifolia) and the beautiful organic Lavandin (Lavandula hybrida) from the cool mountain tops of the Alps, it provides a harmonic balance between the relaxing benefits of lavender and the sweet, fresh floral notes of the Lavandin. Lavender has a sweet & relaxing yet slightly sharp floral aroma. Ingredients: Ohm Blend®, Lavender (Lavandula angustifolia), Lavandin (Lavandula hybrida), Wildcrafted Cedar (Cedrus Atlantica wood) and Tea Tree oil (Melaleuca alternifolia leaf) blended with sodium bicarbonate. Jasmine (Jasmine Grandiflorum) comes from a Persian word “Yasmin” which is a common name for a girl. it’s also referred to as “moonlight of the grove” or “queen of the night” because of its strong scent during the evening hours. Known for it’s seductive qualities. It reminds you of summer evenings and gentle breezes. Jasmine is picked early in the morning, when the sun drives the scent from the flowers. Jasmine has a sweet, sensual floral aroma. Ingredients: Ohm Blend®, Jasmine (Jasmine Grandiflorum), Wildcrafted Cedar (Cedrus Atlantica wood) and Tea Tree oil (Melaleuca alternifolia leaf) blended with sodium bicarbonate. The world has gone coco-nuts, everybody is in love with the tropical taste & scent. The good thing about coconut is that it has anti-fungal properties thanks to it’s caprilic acid, and therefor reduces unpleasant odors. an exotic reminiscence. Are you ready for a holiday? (Cedrus Atlantica wood) and Tea Tree oil (Melaleuca alternifolia leaf) blended with sodium bicarbonate. Because their roots are Hawaiian we have used Gardenia (Gardenia jasminoides) It’s one of the most precious oils in the world and known for its heavenly aroma and fragrance. Our gardenia is Natural (compared to the most) and wildcrafted. Gardenia flower is commonly used in Chinese herbal medicine. Gardenia has a rich, feminine perfectly balanced floral aroma. Ingredients: Ohm Blend®, Gardenia (Gardenia Florida Oil), Wildcrafted Cedar (Cedrus Atlantica wood) and Tea Tree oil (Melaleuca alternifolia leaf) blended with sodium bicarbonate. Neroli (Citrus aurantium) was used by the Ancient Egyptians to heal the mind, body and spirit. It was highly regarded and used by the priestesses and priests. It’s fruity and sweet aroma is very calming and relaxing. Neroli oil comes from the blossoms of the orange tree. Named so after Princess of Neroli as she used it to perfume her gloves and used it in her baths. The petals of Orange flowers symbolize innocence and securing love. Neroli has a slightly sweet, earthy floral aroma with a unique depth. Our Omanian Frankincense (Boswellia carterii) comes from the Ancient Frankincense trees in Oman, Where these oils are used for both physical and spiritual protection. Sacred Frankincense from Oman has deep metaphysical and protective qualities for both mind and body. It was more valuable than gold in the old days, and we believe in the future too when more and more folk discover the ancient wisdom connected to these oils and their healing properties. Knowledge and usage of Frankincense dates back even to the time of the Sumerians, it was also given to Christ at the time of his birth. Frankincense has a deep, slightly spicy, woody resin scent. What Part of the Plant is Used? Resin from Oman, the finest and the oldest trees used. Ingredients: Ohm Blend®, Frankincense, (Boswellia carterii), Wildcrafted Cedar Cedrus Atlantica wood) and Tea Tree oil (Melaleuca alternifolia leaf) blended with sodium bicarbonate. (Cedrus Atlantica) The Cedar tree is famous from Lebanon to the temple of Solomon, as the latin name shows it is a powerful deodorizing essential oil. If you suffer from excessive perspiration and/or body odor, they recommend this fragrance and looking into the benefits of a alkalizing diet, for a fragrant body odor. Cedarwood has a characteristic woody fragrance. Ingredients: Ohm Blend®, Wildcrafted Cedar, (Cedrus Atlantica wood), Frankincense, (Boswellia carterii) and Tea Tree oil (Melaleuca alternifolia leaf), blended with sodium bicarbonate. The Ohm collection is sold in many brick and mortar stores in the Netherlands and as said online. DiscIosure: I have not been sponsored by the Ohm collection or Green Jump for mentioning their businesses, this review is based solely on my own experience ! This entry was posted in Healthy Body, Lifestyle, Natural Beauty & Wellness and tagged Beauty, personal care by danielleslingerland. Bookmark the permalink. Dit klinkt geweldig! Ik ga op zoek. Dankjewel Daan!! !